Eliminates dandruff and slows down its reappearance. Technology: Pur Detox. Zinc Pyrithione. Salicylic Acid. Benefits: It gently eliminates dead skin cells and removes impurities from the surface of your scalp. Refreshing action, leaving you with beautiful, soft and detangled hair. Application: Apply to your wet hair and gently massage your scalp with the flats of your hands. Repeat application and leave on for a few moments. Emulsify by adding a small amount of water. Rinse thoroughly. 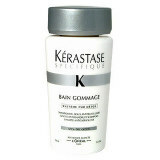 In case of contact with your eyes, rinse immediatelyand soothed scalp from the first application. Hair feels soft and shiny.